Optimist Lofts is an urban oasis in the desert that is the Atlanta apartment scene. We offer studio, one and two bedroom loft-style apartments for rent in the heart of Piedmont/Buckhead. Our chic and stylish floor plans blend five-star amenities with a first class location. Located on Piedmont Rd near I-85, our mid-rise apartment community offers you an enviable space to show off to your friends. Each loft-style apartment features a modern kitchen with cozy breakfast nook, granite countertops and stainless steel appliances. Our 10-foot vaulted ceilings add to the spacious feel of your home. We also offer walk-in closets and a private patio or balcony with breathtaking views of the city. Living in Atlanta, sometimes you might feel cramped. Not so at Optimist Lofts. 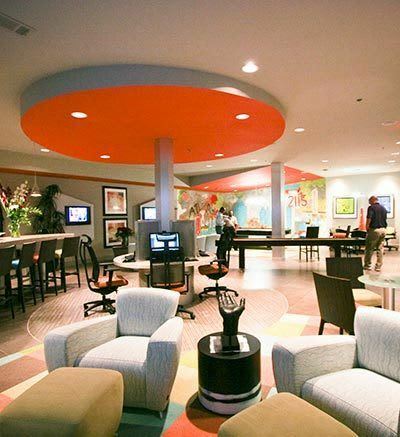 We provide you with the space you need to kick back and relax after a long day at the office. Our urban-inspired apartments are incredibly spacious. Our studio and one bedroom floor plans range in size from 662 square feet to 1,033 square feet. The open living and dining space is ideal for entertaining. We also offer a number of two bedroom layouts for you to choose from. These units vary in size from 1,165 square feet to 1,464 square feet. But at Optimist Lofts, we don’t just lease residential spaces, we also offer live/work apartments as well. These beautiful floor plans seamlessly integrate your office and home. Downstairs you will find an additional bathroom and meeting space, while the upstairs is all yours. Live/work apartments are available in both one bedroom and two bedroom layouts. For more information about apartments for rent in Piedmont/Buckhead Atlanta, contact Optimist Lofts today.